A super convenient helix piercing! With this tragus / helix piercing you can do loads of stuff. Especially meant as an ear piercing it can be worn in many different places. Since they're also very fairly priced they are ideal to combine by putting several next to each other. A good example of this can be found on the product image. Placing these helix piercings is extra interesting since you get to choose the size of the crystal. Placing several tragus / helix piercings next to each other have been a fashion statement for quite some time now. 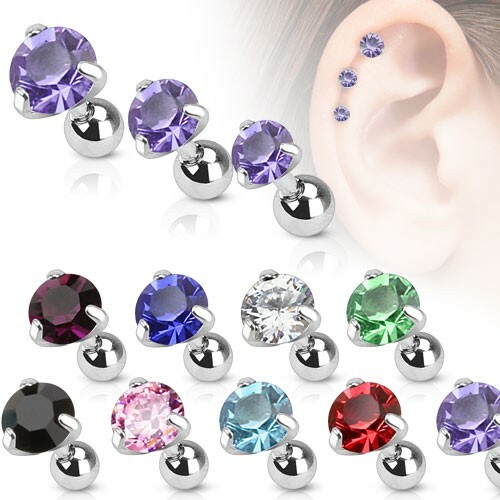 The fact that there is a very wide range of available colours makes that you can do even more with these piercings. The crystal is held in place with three threads. This makes the crystal almost fully free of steel meaning that all focus is drawn to the crystal. That type of placement also makes that the crystal can create strong sparkles a bit easier. Lovely with a good choice of colours! Ordered 3 different colors, white, blue and purple, stone size 3 mm. They all look amazing, really delicate and feminine. Really exceeded my expectations. Going to were them in my high conch piercing. The stones are really shiny and stand out. I'm more than happy with my purchase and would definitely recommend it.